The Godfrey Heritage BiMetal Reel is a modern adaptation of the famous Leonard BiMetal with nickel silver sides and bronze frame. Like all Godfrey reels the BiMetal features single screw take down and the tried-and-true adjustable click pawl drag system. 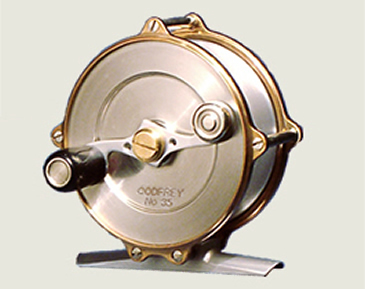 Due to the weight of the nickel silver, this reel is produced in the smaller sizes. This is a wonderfully functional, and certainly an elegant statement to complement your favorite cane rod. * Synthetic line with 20 lb. Micron backing. The GBI 60 frame features a double top post. Frame Size is frame diameter not including the pillars. Off to the wilds of the Catskill Mountains or Slovenian Alpine Trails a BiMetal Reel just feels like a familiar companion. BiMetal Trout Reels come with warranty and maintenance paper with recorded Reel Serial Number in hand made draw string leather bag. Spools are hand fitted so consider extra spools in your initial order.